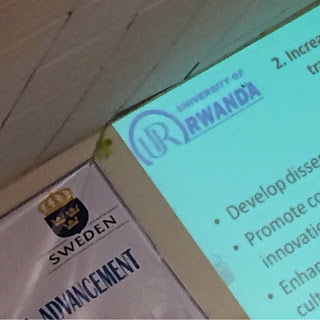 As some of you participate in the short courses organised at the University of Rwanda (UR) College of Business and Economics, the team leaders present, evaluate and review the UR-Sweden programme in the Annual Review Meeting (ARM) of the UR-Sweden Programme for Research, Higher Education and institutional Advancement, here in Kigali. The ARM was officially opened by the Minister of Education. Present are also all principals and coordinators of the UR, as well as the Vice Chancellor and both the Vice Chancellors. The Swedish Embassy and UR-Sweden coordinators play an important role here as well. And hopefully also all of us team leaders. 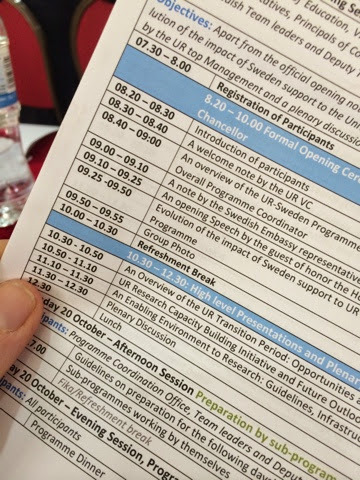 After the grand opening, and overviews of the cooperation and several presentations, we will have much time to work in our respective teams. This is crucial for the development of our sub-programme and we are very happy to be here - and grateful to be a part of this process.